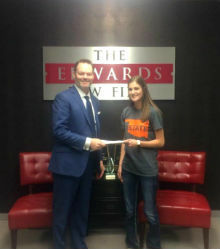 The Edwards Law Firm is proud to announce that Morgan Miller has been selected as the 2017 recipient of The Edwards Annual College Scholarship, brought to you by our personal injury lawyers in Tulsa. Each year, one student is selected to receive the $1,500 scholarship for tuition costs at any accredited college or university in Oklahoma. Applicants must be enrolled in an Oklahoma college or university, maintain a minimum GPA of 2.5 and submit a 500-word original essay based on a pre-selected topic. This year, students were asked to explain how social media can be effectively used to help increase awareness about the dangers posed by texting and driving. In Miller’s essay, she detailed the psychological attachment people have formed with their cellphones, which causes behavior similar to addiction and prevents some from understanding the limitations of appropriate cell phone use. Miller further explains that as social media continues to increase its presence within everyday life and emerging technology, it should be embraced as a tool rather than stigmatized as a hindrance. Her essay examines the instant gratification that social media and cellphone use offers users. It states that instead of being used as a distraction, that gratification could be directed toward an app that would encourage safe driving behavior by rewarding motorists who refrain from using electronic devices while operating a vehicle. Miller’s essay offered profound insight into her generation’s views on technology and provides an inspiring and innovative idea that would encourage safer driving behavior through social media. Miller has shown profound academic achievement in her career as a student. She was valedictorian of her senior class, elected as Class President in 2012 and has received several awards for her academic abilities and leadership skills. Miller is currently enrolled at Oklahoma State University with a 3.8 GPA and intends to graduate in May 2020. Students like Miller offer a strong sense of hope for the achievement and success of future generations and is the reason why the Edwards Law Firm created a scholarship to reward those who exemplify academic excellence. We would like to congratulate Morgan Miller on her current success and wish her the best of luck in all that her future has in store. Looking for a personal injury lawyer that will fight for your case? Give our team a call today for a free, no-obligation consultation.